The domestic market of gift baskets for Tet Holiday (the Lunar New Year) is bustling with activities as demand for gifts has increased. Supermarkets and shops are being busy with offering the finest quality merchandise for gift baskets to satisfy all tastes. Co.opmart, Big C, Vinmart, Lotte Mart, Mega Market have been displaying various kinds of gift baskets so that customers can choose it easily. Retailers predict that purchase power will increase by 20 percent compared to the same period last year and gift baskets from VND500,000 ($21.5) to VND1 million are expected very popular. Saigon Co.op, which operates the Co.opmart supermarket chain, announced this year, its supermarket chain including Co.opmart, Co.opXtra, Co.op Food are exhibiting gift baskets containing goods with clear origin and high quality. Moreover, customers can enjoy free delivery if they do online shopping of 38 baskets with fix price. The Saigon Co.op also announced it has had 12 special gift baskets for workers pricing from VND125,000 to VND299,000 each or fruit gift baskets from VND299,000 to VND1,999,000 each. Additionally, the supermarket chain is also providing free present wrapping for customers. Saigon Co.opmart Marketing Director Do Quoc Huy said that the chain ensures the quality of gift baskets because goods in each basket are selected carefully with clear indication of origin. Gift baskets with average price of the supermarket chain are inclusive of cooking oil, refined sugar, seasoning, fish sauce, pork sausage, fragrant rice, soft beverage, instant coffee, confectionery, noodles, and tea whereas medium and deluxe priced baskets have various sweet and cakes, fruit juice, cashew, chestnuts, soft beverage, beef jerky, bird nest water, dried fruit, and cheese. Fruit baskets include kiwi, blue dragon, mandarin, US apples, US blue and black grapes, grapefruit, custard apple, and mango. Big C supermarket chain is also introducing to customers an array of more than 30 different kinds of gift baskets which customers can get one depending on their taste. 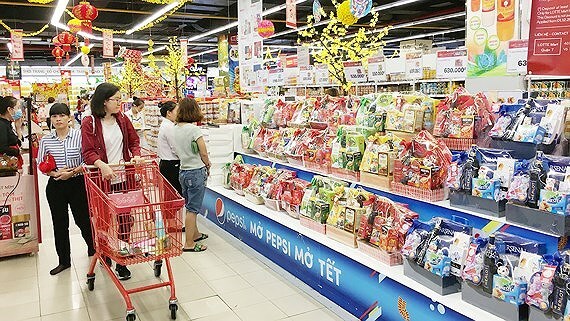 People can get a basket filled with delicious cakes, cookies, processed food, tea and wine whose price fluctuates from tens of thousands of Vietnam dong to below VND2 million. Furthermore, supermarkets are offering some gift baskets with specialties of each localities. For instance, Big C is offering basket “ Huong vi Tet Viet” ( Flavor of Vietnamese Tet holiday) at the cost of VND450,000 comprising of coffee Long Trieu of the highlands province of Lam Dong, tea Hung Thai of the northern province of Thai Nguyen and dried custard apple of the Mekong delta province of Dong Thap. One feature of Lotte Mart supermarket’s hampers for the special holiday is that Vietnamese-made commodities account for high percentage of the essential items. Not only supermarket but also convenience stores and retailers in somewhere in the country have exhibited hampers for the special Tet Holiday. However, people should go to prestigious stores for purchase of gift baskets. The US SEAF Women’s Opportunity Fund (SWOF) managed by SEAF and organic food distributor Organica Investment Company have recently signed an investment agreement to develop retail network of Organica’s organic food in Vietnam. Besides buying in to become a strategic shareholder, SWOF also provides financial resource and corporate governance, and helps Organica to increase transparency in financial administration, improve staff and strengthen infrastructure investment, supply, and farms. Organica started its business with an organic food store in Nguyen Dinh Chieu Street in Ho Chi Minh City in 2013. Up to now, the company has opened five organic stores in the city, Ha Noi and Da Nang. It has ten farms with total area of around 300 hectares which have received organic certificate. Organica is also the partner of well-known organic brands from the US, the EU, South Korea, Australia and Malaysia. SEAF is a US global fund management company which has offices in 29 countries and specializes in investing in small and medium size businesses with high growth potential in emerging markets. In Vietnam, SEAF manages two funds and invests in more than 20 businesses in various fields. SWOF - the newly established fund of SEAF – mainly invests in women-led businesses which have activities and positive impacts on the society, community and the environment. According to the Jones Lang LaSalle Vietnam (JLL)’s report, house sales in Ho Chi Minh City drop to the record low within five recent years. For instance, in the fourth quarter of the year, 118 villas and houses of small projects in HCMC were sold as per JLL, because large-scale projects were facing land reclamation. Also in the fourth quarter, just 340 houses mostly of the available projects were sold while demand was still high with the rate of house sale at 92 percent in 2018. Because of limited supply, prices of houses in this segment are escalating with an increase of 14 percent yearly in the primary market. Additionally, JLL forecast around 4,500 detached villas and houses will offer to sell in 2019 and sales will be high with the rate of 90 percent. Prices will be high but not as same as before. When it comes to dominium projects, nearly 8,300 flats belonging to most housing projects, which were offered for sale in previous quarters, were sold except 70 flats of Goldora Plaza project which was open for sale in the fourth quarter of 2018. More than 8,800 flats were sold in 2018 bringing the total to 40,032. Though sale rate declined by 13.8 percent, sold houses and inventory are still high against the year before. The primary market has seen stability in apartment price in quarters especially luxury and common segment whereas medium priced segment has escalated from 3 percent to 6 percent differently in each quarter. Prices went down in high-end apartments in the secondary while it skyrocketed in the lower priced segment. A secondary investor enjoyed profit fluctuation from 9 percent to 12 percent differently each year. The United States accounts for 91% of Vietnamese shark catfish exports, followed by China at 9%, according to the Ministry of Agriculture and Rural Development. Last year, shark catfish exports brought in US$2.26 billion, up 26.4% against the previous year, thanks to higher prices as a result of greater investment in processing. 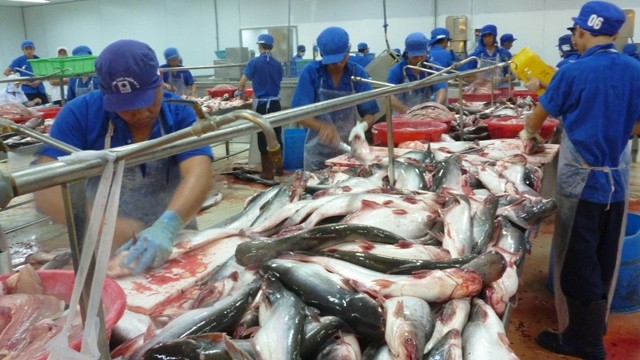 The Vietnam Association of Seafood Exporters and Producers (VASEP) has projected that catfish export revenues in 2019 could continue to remain high at around US$2.2 billion. According to many experts, the US-China trade conflict is producing a positive effect on certain Vietnamese exports, including shark catfish. In addition, when the Vietnam-EU free trade agreement is signed, Vietnam’s shark catfish exports to the EU could also be boosted as a result of tariff elimination for both raw and processed fish. Vietnam’s General Directorate of Fisheries is working with enterprises to further enhance the quality of catfish fillets so as to bolster exports. However, challenges remain while Vietnamese catfish continue to face import restrictions imposed by Europe and the US. The southern province of Dong Nai posted a trade surplus of more than US$2.6 billion in 2018, representing over 30% of the total trade surplus of the whole country, according to the provincial People’s Committee. Dong Nai is currently one of the leading cities and provinces in terms of trade surplus nationwide. Regarding the United States market alone, the locality reported an export turnover of approximately US$4.7 billion last year, up 8% compared to 2017. The US is the largest export market for Dong Nai with a moderate growth rate for years. The province’s major exports to the US include footwear, garment and textiles, textile fibre, timber products, machinery and auxiliary parts. At present, Dong Nai has nearly 4,000 businesses exporting goods to most countries and territories around the world. Footwear, garment and textiles, fibre, machinery and auxiliary parts are the province’s five key groups of export items with large revenues, among which footwear products took the lead with a turnover of nearly US$3.7 billion in 2018. The aforementioned key groups of commodities posted a combined value of US$10.2 billion, accounting for more than half of Dong Nai’s total export turnover. 2014 was the first year that Dong Nai shifted from a trade deficit to a trade surplus of US$625 million. By the end of 2018, the province’s trade surplus increased over fourfold compared to the previous four years. Deputy Prime Minister Vuong Dinh Hue chaired a meeting with ministries and localities in Hanoi on January 14, focusing on the building of a project on perfecting institutions and policies and enhancing the efficiency of foreign direct investment (FDI) attraction and utilisation until 2030. The project, which will be submitted to the Politburo for approval, should highlight key contents related to FDI to lay a foundation for FDI attraction in the next period, Deputy PM Hue said. The Government official noted that the project is not to establish guidelines, but to complete mechanisms and policies on FDI attraction, in addition to improving the legal system and guidance decrees on tax, business, investment and land use. Deputy PM Hue asked the Ministry of Planning and Investment to listen to and collect opinions from experts, particularly regarding directions of the Prime Minister at the national conference on 30-year FDI attraction, to complete the project. According to Deputy Minister of Planning and Investment Vu Dai Thang, Vietnam has a 30-year history of attracting FDI, which has become a crucial economic component, contributing significantly to the development of the country. However, the Party Central Committee, the Politburo, and the Secretariat have yet to develop a specific resolution on FDI attraction. Therefore, the building of the project to submit to the Politburo is of great importance, creating a basis for attracting FDI in a more selective manner in accordance with the process of economic restructuring while promoting benefits and limiting the inadequacies of FDI. Foreign direct investment enterprises accounted for 65.22 per cent of Vietnam’s total trade turnover in 2018, representing a 11.7 per cent on-year rise, according to the General Department of Vietnam Customs. Vietnam raked in US$243.48 billion from exports, up 13.2 per cent on-year. 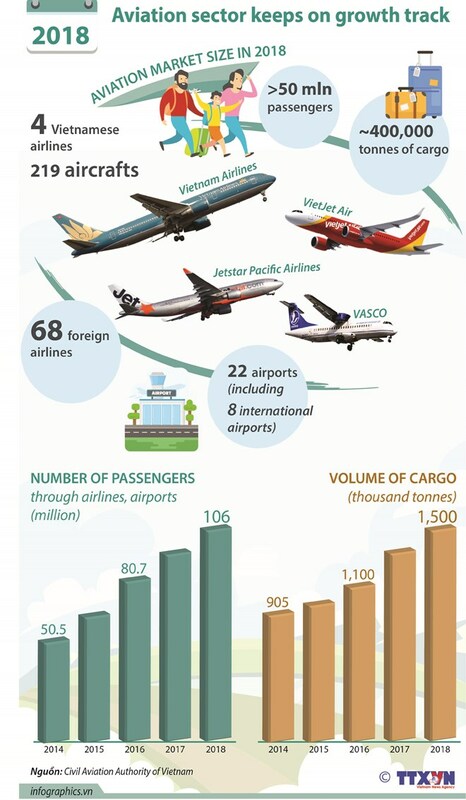 News outlet VnEconomy cited freshly-released statistics from the General Department of Vietnam Customs as saying the country’s trade turnover in 2018 amounted to US$480.17 billion, an on-year rise of 12.2 per cent. Notably, the trade turnover of foreign direct investment (FDI) enterprises reached US$313.21 billion, equivalent to 65.22 per cent of the total and a 11.7 per cent on-year rise. Domestic firms contributed US$166.96 billion to the total trade value, surging by 13 per cent. Vietnam saw a trade surplus of US$6.8 billion in 2018, a 3.2-fold increase on-year. In particular, the country raked in US$243.48 billion from exports, up by 13.2 per cent on-year. Of these, US$171.53 billion was contributed by FDI enterprises, registering 70.4 per cent of the total export value, up 12.4 per cent on-year. Telephones, garment and textiles, computers, machinery, and aquatic products topped the list of exports. Meanwhile imports also enjoyed a strong year. Imports totaled US$236.69 billion, an on-year hike of 11.1 per cent. The FDI sector held the largest proportion of nearly 60 per cent with US$141.68 billion in import value, rising by 10.8 per cent on-year. Computers, machinery, telephones, garments, and petrol were among the top import categories. Vietnamese firms are introducing confectionery, beverages and fruits at the Indus Food 2019 fair, which opened on January 14 in Greater Noida city in India’s northern Uttar Pradesh state. The two-day event allows Vietnamese entrepreneurs to introduce the country’s farm produce in the local market, while seeking business opportunities with Indian and international importers. A seminar between businesses of Vietnam and India was held within the framework of the trade fair, with the participation of officials in diplomacy, agriculture, trade and industry. During the event, some Vietnamese firms are set to ink distribution deals in the South Asian nation with Indian partners. Indus Food is among the largest international trade fairs in foodstuff and beverages. More than 450 Indian and international businesses are introducing their products at the event, including devices in food manufacturing and packaging, along with dairy products, meat, fresh fruits, spices and herbs. The Comprehensive and Progressive Agreement for Trans-Pacific Partnership (CPTPP), which came into force in Vietnam on January 14, will support free trade amid ongoing global trade tensions, according to HSBC Vietnam. The CPTPP gathers 11 economies, namely Canada, Australia, Brunei, Chile, Japan, Malaysia, Mexico, New Zealand, Peru, Singapore and Vietnam. Its enforcement is the latest demonstration of trade liberalisation in Asia-Pacific, experts have said, noting that Japan and Singapore recently signed bilateral free trade agreements (FTAs) with the European Union. An FTA between Vietnam and the EU is hoped to be signed in the near future, while Australia, Indonesia and New Zealand are also negotiating similar deals with the EU. The CPTPP will eliminate 95 percent of tariffs among member countries, and Vietnam has opportunities to gain immediate trade benefits from it, especially in the textile-garment and footwear industries – two of the country’s biggest foreign currency earners. CEO of HSBC Vietnam Pham Hong Hai said in the context of trade tensions, the CPTPP reflects the Vietnamese Government’s determination to boost trade liberalisation and build a rules-based trading system. He expressed his belief that businesses will benefit from access to 500 million consumers and regulations on transparency. The CPTPP will not only promote trade among its members – their exports are predicted to rise by more 6 percent collectively, with 8 percent for Vietnam, by 2030 – but also lead to shifts in global supply chains when trade flows move towards member countries. According to an HSBC Navigator survey, about 39 percent of enterprises in the CPTPP members believe the agreement will directly or indirectly support their business activities in both the short and long terms. Chairman of the Vietnam Chamber of Commerce and Industry Vu TienLoc said thanks to the CPTPP, markets for Vietnamese firms will be expanded when most tariff barriers are removed. They will have chances to bolster exports, especially in products of Vietnam’s strength like textile-garment, footwear, handbags, and electronic, aquatic and agricultural products, to other member economies. Local companies will also have more opportunities to diversify partners, mobilise resources, attract investment capital, import high-tech equipment, and join global value chains. He added that the commitments under the CPTPP will generate a driving force for economic institutional reforms, thus creating a better environment for businesses. Vietnam should create breakthroughs in 2019 to complete the 2016-2020 socio-economic development plan and create a foundation for the next five years, Minister of Planning and Investment Nguyen Chi Dung has said. In an interview with the Vietnam News Agency, the official stressed greater efforts are needed to fulfill the GDP growth target of 6.8 percent set for 2019 by the National Assembly. To that end, he proposed improving the domestic business environment to facilitate the operation of businesses and reduce production and business costs. The private economic sector is expected to drive growth, he said, emphasising the need to remove difficulties and barriers and create an equal playing field for enterprises. The Government has taken actions to enable businesses to access new technologies as scientific-technological innovation is an urgent need of the national economy, the minister noted. Preparations for intensive international integration and the improvement of the capacity of the national economy as well as businesses would help Vietnam optimise opportunities, especially those generated by the Comprehensive and Progressive Agreement for Trans-Pacific Partnership, which came into force in Vietnam on January 14, he said. Dung also said the Association of Southeast Asian Nations (ASEAN) and Vietnam are expected to remain attractive destinations for global investment in 2019. Reviewing Vietnam’s economic performance in 2018, he said national GDP grew 7.08 percent, the highest level over the past 11 years. Noteworthy was the agro-forestry-fishery sector, which expanded 3.76 percent in the year, a record rise, he said, highlighting a trade surplus of 7.2 billion USD, foreign direct investment (FDI) disbursement exceeding 19 billion USD, and inflation below 4 percent. The country’s impressive performance received praise from international organisations and the World Bank, he said. According to the minister, the highlight of the national economy lies with its resilience, which is consolidated by the export and processing and manufacturing industry. He, however, pointed out difficulties facing the economy such as uncertainties of the global economic situation and impacts of US-China trade tension. Internal weaknesses like small economic scale, low competitiveness and productivity, climate change, natural disasters and diseases, among others have also hindered growth, the official said. Dung expressed his belief that efforts of the entire political system would help the country overcome these obstacles in 2019. Seafood processors Hung Vuong JSC (HVG) has reported its post-tax profits gained VND9 billion (US$387,000) to VND16 billion for the financial year. This amount is for the period starting on October 1, 2017 and ending on September 30, 2018, after the firm’s financial report was audited. The company recorded a loss of VND705 billion in the financial year 2016-17. The company earned big from selling its assets. In November 2017, HVG collected VND486.8 billion from selling its 54.3 per cent stake at Sao Ta Foods JSC. In July 2018 last year, the company offloaded its 57.2 per cent stake in Viet Thang Feed JSC to earn VND861 billion. In September 2018, the firm earned VND151 billion from selling one of its cold stores. But total revenue in the financial year 2017-18 dropped 47.6 per cent year on year to VND8.23 trillion as its business activities saw a steep decline.Export revenue fell to VND3.3 trillion from VND7.4 trillion. Another factor that keeps weighing on the future prospects of the seafood business is the firm’s short-term liabilities owed to the Joint Stock Commercial Bank for Foreign Trade (Vietcombank) and the Joint Stock Commercial Bank for Investment and Development of Vietnam (BIDV). The loans are still to be paid back. According to Hung Vuong JSC’s audited financial statement, the company borrowed a total VND2.76 trillion ($119 million) from the two banks in July 2018 and October 2017. The loans are due in March, June and August 2019. Of the total borrowings, current portions of short-term liabilities were VND52.5 billion for BIDV and VND554.2 billion for Vietcombank as of September 30, 2018. The seafood processing firm had asked Vietcombank to extend the due date for the short-term liabilities to the next eight years, Hung Vuong JSC said in its audited financial statement. HVG also made loans from other commercial banks such as Vietinbank, HDBank and Agribank. The borrowings are due before June 2019. The company mortgaged its land use licences to those banks as parts of the borrowing contracts. According to Ernst & Young Vietnam, the short-term liabilities raised the doubts about the consistent operation of the seafood business. The company is listing 227 million shares on the Ho Chi Minh Stock Exchange with code HVG. Its shares has plunged 7.4 per cent in the last two sessions after gaining a quarter in four trading days to VND5,500 per share on Wednesday. PetroVietnam Power Corporation (PV Power) shares jumped 4.7 per cent following the company’s debut on the Ho Chi Minh Stock Exchange (HoSE) on Monday. PV Power started listing more than 2.34 billion shares on the southern bourse with code POW at the initial price of VND14,900 per share (US$0.64). Shares ended Monday at VND15,600 per share, up 4.7 per cent from the initial price level. The company’s market capitalisation reached VND36.53 trillion ($1.57 billion) at the end of the trading day. On December 28, PV Power cancelled the trading of more than 467.8 million shares on the Unlisted Public Company Market (UPCoM) to move to HoSE. The company debuted on UPCoM on March 6, 2018 at VND17,500 per share after offloading 467.8 million shares at its initial public offering (IPO) in January 2018. The firm shares fell by as much as 37 per cent to VND11,000 per share on July 12-17, 2018 during the UPCoM period before rising back to VND16,000 per share in the last trading day on December 27, 2018. PV Power is among the country’s biggest power producers, recording a total output of 21 billion kilowatts per hour (kWh) last year. The company earned total VND33.36 trillion in revenue for the past 12 months, beating its forecast by 6 per cent. The pre-tax profit for 2018 reached VND2.31 trillion – an increase of 24 per cent from the full-year expectation. In 2019, PV Power is hoping total production will reach 21.6 billion kWh, VND32.7 trillion in revenue and VND2.3 trillion in post-tax profit. According to the company chairman Ho Cong Ky, the Vietnam National Oil and Gas Group (PVN) – parent firm of PV Power – will offload parts of its 80 per cent stake in the latter via the stock market. PV Power had previously failed to seek the strategic investor after completing the sale of 467.8 million shares at the IPO earlier this year. Under existing regulations, a post-IPO State-owned enterprise (SOE) must look for and select the strategic investor within three-four months from the IPO. It was difficult for the firm to find and pick a suitable strategic investor in such a short period, especially foreign investors that wanted to assess the targeted local business, Ky said at the firm stock debut. PV Power and PetroVietnam Gas Corporation (PV Gas) on Thursday signed an agreement on the supply of liquefied natural gas (LNG) for the former’s Nhon Trach 3 and 4 power plants. PV Gas’ Thi Vai LNG Terminal and Nhon Trach 3 and 4 power plants are among top-priority energy projects developed by PVN and are key to the development of the Vietnamese oil and gas industry. Thi Vai LNG Terminal is developed by PV Gas with total capacity of one million tonnes of LNG per year. It is scheduled to operate in 2021-22 and total capacity is designed to reach three million tonnes per year by 2025. Nhon Trach 3 and 4 power plants are developed by PV Power as the first to use LNG for electricity production. The plants are designed to produce nine billion kWh each year with a productivity of 1,500 megawatts. Sacombank and Japan’s JCB International Co, Ltd on Monday signed an agreement to deploy the latter’s QR code payment system and launch the Sacombank JCB platinum debit card. The QR code payment service allows Sacombank JCB cardholders to use their mobile devices (mobile phones/iPads) to scan QR codes to pay at stores quickly and safely. Holders of JCB cards issued by other banks can also make payments using the QR codes at point of sale associated with Sacombank. Sacombank has a network of more than 2,500 merchants and plans to increase the figure by 30-40 per cent this year. Nguyen Minh Tam, deputy CEO of Sacombank, said the bank has always been a pioneer in applying modern payment technologies and was the first bank in Viet Nam to issue contactless Visa cards and use the QR payment method for international cards. Sacombank-JCB Platinum debit card holders will get privileges, including access to more than 60 airport lounges in Japan, mainland China, Hong Kong, Singapore, the Republic of Korea, Thailand and Viet Nam, 24/7 global support through a free hotline and up to 50 per cent discounts on domestic and foreign spending. The Central Highlands Province of Dak Nong should streamline administrative procedures to create the most favourable conditions for investors, Prime Minister Nguyen Xuan Phuc said. The PM delivered the remarks during an investment promotion conference held in the province on Monday. The event – the biggest of its kind so far – witnessed the participation of nearly 1,000 delegates and business people at home and abroad. In order to ensure the success of investors, which should be considered the success of Dak Nong, the PM urged the locality to have professional staff which could assist investors in dealing with its administrative procedures. That could contribute to improving its investment climate. Such improvement could then compensate for its other disadvantages such as inadequate infrastructure, the PM said. In his speech at the event, the PM also advised Dak Nong to promote trade development. According to PM Phuc, the province should focus on products overseas markets need rather than those it could supply. Fostering the application of technology to expand its production capacity and improve the quality of its products and surveying customers’ demand should also be included, he noted. During the conference, representatives from the FLC Group praised the strong commitments of local authorities in creating a transparent investment climate with many investment incentives, revealing the group’s desire to develop tourism projects here. Other firms such as T&T and Sam Agritech expressed their interest in the province’s untapped agriculture sector thanks to the province’s large cultivated area, totalling about 588,000ha. At the conference, the provincial People’s Committee granted investment licences to four projects worth of VND2.7 trillion ($116 million). The committee also signed deals worth total registered capital of more than VND48 trillion ($2.06 billion). Dak Nong is a gateway to the south of the Central Highlands. It shares a borderline of 130km with Cambodia and two border gates. The province has large areas of fertile land and mild climate suitable for agriculture, especially industrial crops and fruit trees. It is rich in mineral resources, particularly bauxite. It also has great potential for tourism development thanks to a beautiful landscape and the rich culture of local ethnic communities. Despite these advantages and potentials, the province’s results in investment attraction remained modest, local authorities said. Statistics from the Foreign Investment Agency (FIA) revealed that the province lured only one foreign-invested project, worth US$48 million, in 2018. The latest addition has brought its total number of foreign-invested projects up to 12, capitalised at $145 million. Currently, the province ranks 53rd among 64 localities in terms of foreign direct investment attraction, FIA’s data showed. In order to attract more investment, local authorities have put forth a number of specific policies and mechanisms to draw investors, including the approval of a resolution in August 2018 to encourage and attract investment in the province. Besides accelerating administrative reform, the province has promoted the application of information technology and improved the business investment environment. The province has put into operation two industrial parks on a combined area of 328ha and it is making a planning scheme for Nhan Co 2 Industrial Park on over 800ha to facilitate investment in mining and aluminium processing projects. Luu Van Trung, Director of the provincial Department of Planning and Investment, said the locality wanted to call for domestic and foreign economic groups to invest in the fields of hi-tech agriculture, mining, renewable energy, and tourism, in line with the province’s development direction for 2015-20. The 11th Congress of the province’s Party organisation for the 2015-20 tenure defined three breakthroughs for the local economy, which were mining-energy, processing-hi-tech agriculture, and tourism-service, Trung said. They met with representatives of the German Institute for Economic Research, the Federal Ministry of Finance and the Finance Committee of the German Bundestag (Parliament) on Monday. The host experts and managers talked about tax and financial management, tax collection and policies in the country and the European Union. Vietnamese officials discussed real-life cases to learn the most effective applications for the country. They also had a working session with representatives of the German state of Hesse to explore the role of states in tax and budget management. Resolution 162/NQ-CP issued by the Government has defined 2019 as a year of breakthrough in development in order to successfully implement the 2016-2020 socio-economic development plan. The Government also set the motto for 2019 as “Discipline, integrity, action, creativity, efficiency”, under which ministers, heads of agencies, and chairs of People’s Committees of provinces and centrally-run cities are required to uphold their responsibility towards the country and the people, maintain strong leadership and close supervision of the operation of their subordinates, and pursue reform. The Government urged ministries, sectors and localities to actively press ahead with the implementation of tasks on economic restructuring and growth model switch as defined in Resolution 5-NQ/TW dated November 1, 2016 of the Party Central Committee, Resolution 24/2016/QH14 dated November 8, 2016 of the National Assembly, and Resolution 27/NQ-CP dated January 21, 2017 of the Government. The Government required ministries, agencies and localities to continue to build consensus on developing the private economic sector and implement their assigned tasks under the Government’s plan of actions to carry out the Party Central Committee’s Resolution 10-NQ/TW and other Government resolutions on bettering business environment and supporting enterprises’ development. Ministries, agencies and localities should take the initiative in reviewing existing mechanisms and policies and proposing necessary adjustments and revisions to facilitate the development of the private economy. At the same time, they should continue to popularise the standards and content of the socialist-oriented market economy and actively implement the Party Central Committee’s Resolution 11-NQ/TW on perfecting institutions of the socialist-oriented market economy. To accelerate the building of an e-Government towards a digital Government, the Government required ministries, ministerial agencies, government agencies and People’s Committees of provinces and centrally-run cities to increase the pace of building institutions and full legal foundation for the work. They must work harder to complete fundamental national databases and establish app systems to serve the people, enterprises and the Government’s management and governance. Ministries and ministerial-agencies must give more responsibility in administrative reform to officials holding top positions, while continuing to review and streamline administrative procedures and business conditions, preventing the arising of new business conditions and commodities subject to specialized inspections, and abolishing the combination or addition of business conditions to legal norms issued by ministries, sectors and localities. The Government urged the effective implementation of the national and ASEAN single window systems, the one-stop-shop mechanism for all administrative procedures meeting requirements set by Decree 61/2018/ND-CP, and the one-stop-shop portals at ministerial and provincial levels. Hong Kong healthcare and beauty retailer Watsons will open its first outlet in Ho Chi Minh City on January 17. According to InsideRetail Asia, the store will open in District 1. Watsons has also set up a Facebook page dedicated to consumers in Vietnam. A.S. Watson Group, belonging to Hutchison Holdings Limited, was established in Hong Kong in 1841. Watsons is one of the largest and fastest growing cosmetic and pharmaceutical retail chains in the world with around 6,800 stores in 12 markets in Asia and Europe, including Hong Kong, Indonesia, Macau, mainland China, Malaysia, the Philippines, Singapore, Taiwan, Thailand, Turkey, Ukraine, and Russia. A.S Watson Group also owns other major retail brands such as Drogas, Superdrug, and Watsons' Wine. It has more than 2.4 billion member customers and more than 140,000 employees worldwide. With its cosmetics sales growing annually at around 30 percent, Vietnam is considered a potentially lucrative market by Watsons. While demand has been huge, supply does not yet meet consumers’ needs. The main distribution and trading channels for foreign cosmetics are online stores, people carrying them from abroad and small shops. According to the Vietnam Essential Oils Aromas and Cosmetics Association, the beauty care industry was worth $1.2 billion in 2016. British research firm Euromonitor International, reported a year later that 90 percent of beauty products in Vietnam were imported. At least three major infrastructure projects are subject to the auditing plan set for 2019, according to State Auditor General Ho Duc Phoc. Ben Thanh-Suoi Tien metro line and 10-trillion-VND flood control project in Ho Chi Minh City along with Cat Linh-Ha Dong railway line in Hanoi are among the key projects to be audited this year. Stating at a meeting in Hanoi on January 14 to launch the agency’s tasks in 2019, Ho Duc Phoc, Auditor General of the State Audit Office of Vietnam (SAV), said that the SAV will carry out auditing projects on the refund of value added and information technology application of the General Department of Taxation and the General Department of Vietnam Customs, alongside the contracts of build-transfer projects. During the year, as the sector will pay great attention to large-scale projects, the number of audits will reduce by about 20 percent, he said. The Auditor General underlined that 2019 is a decisive year in implementing the strategy of State Audit development towards 2020, and will be the first year that the State Audit performs the role of the ASOSAI Chair in the 2018-2021 period. Last year, the State Audit successfully hosted the 14th Assembly of the Asian Organisation of Supreme Audit Institutions (ASOSAI), receiving compliments from foreign friends, he noted. Phoc also reported that last year, the State Audit completed 100 percent of its plan. As of December 31, 2018, the agency proposed a fine of 89.6 trillion VND, while helping call back more than 20 trillion VND of State budget and reduce budget spending by 44.4 trillion VND, up 18.39 percent compared to the previous year. The State Audit suggested amendments to and the cancellation of 115 legal documents, while giving ideas to fix shortcomings in the management of value added tax and export tax, as well as the management of natural resources, economic zones, and ODA resources, he said. At the conference, National Assembly Vice Chairwoman Tong Thi Phong and head of the Party Central Committee’s Organisation Commission Pham Minh Chinh presented the State President’s Independence Orders of different classes, the Prime Minister’s Certificate of Merit, and the Government’s emulation flags to collectives and individuals from the State Audit in recognition of their outstanding operational achievements.